An RAF Police dog handler puts his police dog ‘Pacino’ through his paces on the dog agility course on Trebelzue airfield at RAF St Mawgan in Cornwall. 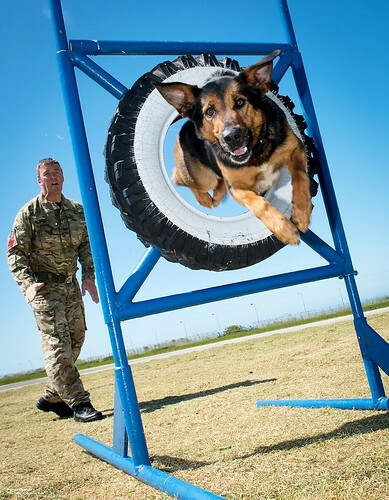 Pacino is a tracker dog and is used to support the Defence SERE (Survival, Evasion, Resistance, Extraction) Training Organisation during their training courses as well as providing security for the Station.Cpl Tony Rogers is an RAF Photographer currently based at RAF St Mawgan. This year, for the first time, the RAF is asking the public to vote for their favourite image in one of the categories. The judges have selected a shortlist of 9 of the best photographs from the whole competition and the public can now vote for their favourite image. This will become the ‘People’s Choice: Image of the Year’. Voting is at: www.raf.mod.uk/photo-of-the-year-2014. Voters will be entered into a free prize draw when they tweet their vote for a chance to win an iPad Mini with a Red Arrows 50th Anniversary universal cover and an iPhone 5S cover. Voting opens today and closes at midnight on 27th August. The winning Photo will be announced at the Presentation Ceremony on 2nd September. Each year, stunning photographs are published following the RAF Photographic Competition and the winning military and civilian photographers are named. The Royal Air Force Photographic Competition judging has recently taken place at the RAF Museum, Hendon. The judges were; Alan Sparrow, Chairman of the Picture Editors Guild and Executive Picture Editor of the Metro; David Clapp the renowned landscape and travel photographer; and Paul Hudson from the RAF Museum.